Do you think that part of our inability to see each other is that we aren’t compatible because of our astrological signs? Capricorns can’t take a joke. Capricorns are closed off people. As he got to know me, he agreed that it is probably true. But finding someone who gets you is becoming an interesting task. There are many suitors but I find that many people play games. Disguise their wants/needs in ambiguity and try to act like we want the same things. In other words they are pursuing me for their own purpose. Some get eliminated easily based off incompatibility. Some go through the process and pretend that they are what I’m looking for. Others lose interest because “I’m not giving it up”. In the end, this is a lonely journey. But, I’m a resilient. I’m not easily swayed by the emotions of people I don’t know. I will complain, over analyze and try to determine your true motives, but in the end I know that it will probably not work. I’m not into playing games. I don’t express my emotions easily. I’m cautious with men. 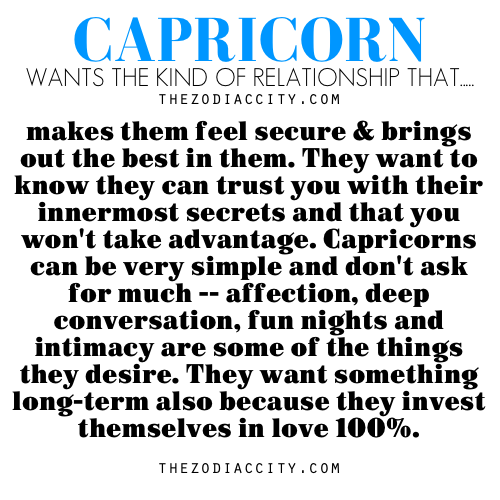 The Capricorn woman is as romantic and emotional as anyone else, but can be somewhat inhibited in expressing her emotions, often preferring to perform practical tasks to help loved ones in preference to making purely romantic gestures. If she seems more interested in being your personal assistant than getting you into bed, this is often just her way of showing she cares! I won’t give up. I will continue to be optimistic and remain steadfast in the search for optimal compatibility. I’m in no rush.